Superhero video games have a tendency to miss just as much as they hit. For every Batman: Arkham Asylum there’s a Superman 64, for every The Incredible Hulk: Ultimate Destruction there’s a Catwoman. Suffice it to say that although superpowered beings and high-octane action are synonymous with both gaming and comic book heroes, it takes the right kind of studio working with the right kind of license to make something compelling for both fans and gamers alike. Oh, and being on the world’s current biggest console manufacturer’s bankroll is sure to help, too. Yes, despite the tangled web of licensing agreements surrounding the franchise across multiple mediums, everyone’s favourite web-crawler has found a home (in video game form) exclusively on the PlayStation 4 in Marvel’s Spider-Man. 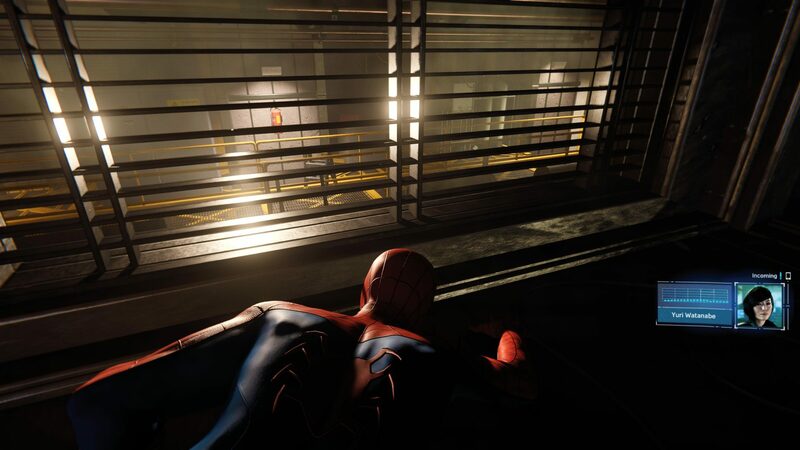 What’s more, the Marvel-backed and Sony-funded game is a product of powerhouse developer Insomniac, a combination that almost guaranteed a hit in the making before it was even a known quantity. But where to take inspiration from? The Arkham games are an obvious choice, as is the fan-favourite Spiderman 2, both of which Insomniac riff heavily on while leaning on their own unique DNA to round it all out. The result is a game that looks fantastic and plays wonderfully, even if it is a tad derivative. Guess it’s time to go hand-over-Fisk, huh? Get it? In an age where Hollywood has booted and rebooted their superhero stories more times than anyone can count, it’s refreshing (and relieving) that this is not an origin story. The Peter Parker of this game is 23 years old, and has already been making the rounds as Spider-Man for around eight years when the game starts. This makes for a story that is snappy and rich with great character drama without being bogged down in setup or exposition. I won’t delve too much into the plot here, but having a catalogue of previously-thwarted villains and well established relationships to draw from has resulted in a game that moves at a cracking pace while consistently throwing new ideas into the mix that keep it compelling. From the opening moments where Peter juggles the daily hero grind on top of his own personal interests, to the intense and bombastic mass villain-hunt of the third act, Marvel’s Spider-Man hands in a superhero story that stands toe-to-toe with Hollywood’s best. 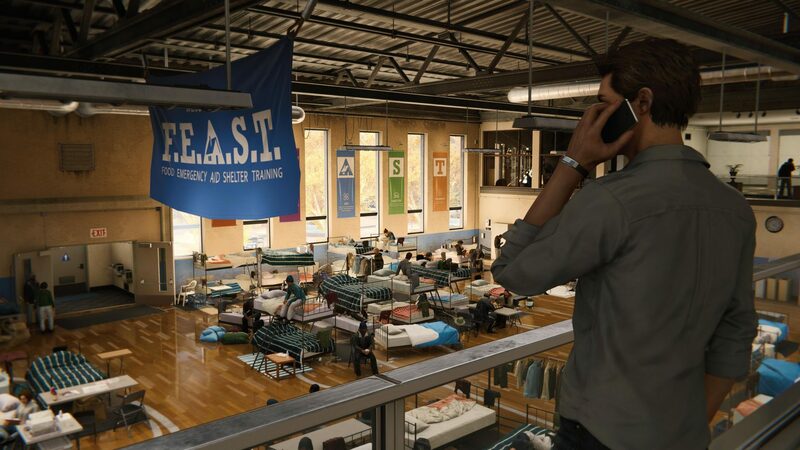 They say that a good video game hooks players by showing off its best tricks in the first hour, and Insomniac have taken that philosophy up a notch. Within about two minutes of the game’s opening, players are controlling Spidey and let loose to swing all throughout the game’s open world. Marvel’s Spider-Man does a lot of good things, but far and away its greatest triumph is in just how damn fun it is to swing through the city of Manhattan. 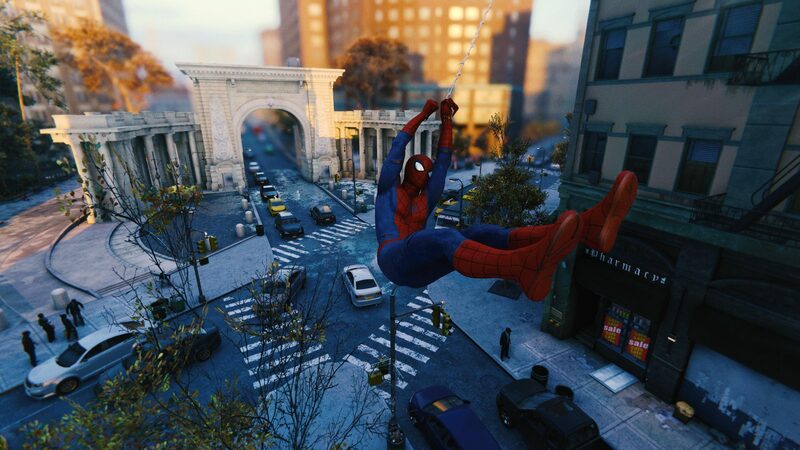 The game’s web traversal mechanics are nothing short of technical wizardry; a physics-based swinging where webs must connect realistically with buildings and other objects, that still manages to feel tight, responsive and manageable 100% of the time. Flying through city streets and around skyscrapers at breakneck speeds is exhilarating and effortless, with a great escalating system of controls that ensures one button is always enough to move forward uninterrupted while more granular control and finesse can be achieved with more skill. 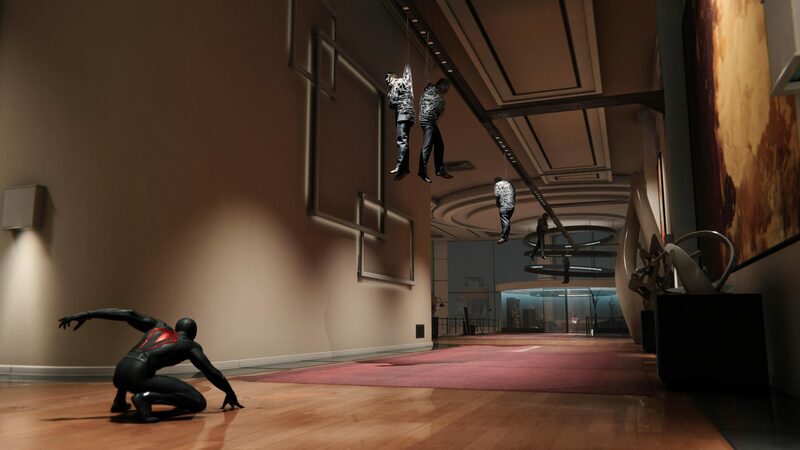 Combat in Marvel’s Spider-Man is engineered with this same philosophy of crafting a fun and fluid baseline before layering on extra depth. Fights with the game’s menagerie of street thugs, henchmen, soldiers and supervillains borrow liberally from other modern third-person action games by offering up a mix of combo-based brawling and reactive dodging and countering. Just like in the Arkham series and the many games it’s inspired since, hammering the attack command sends Spider-Man’s fists flying into the faces of his foes, while his ‘Spider Sense’ alerts him to incoming attacks that can be dodged at any moment at the touch of a button. Spidey’s web powers add some nice wrinkles to the formula though, with my favourite function being his ‘web strike’, an attack that sees him use his web to zip across to his enemies to pummel them. Using this is a great way to quickly close distances in a fight, and to keep the action going even when baddies are off-camera. 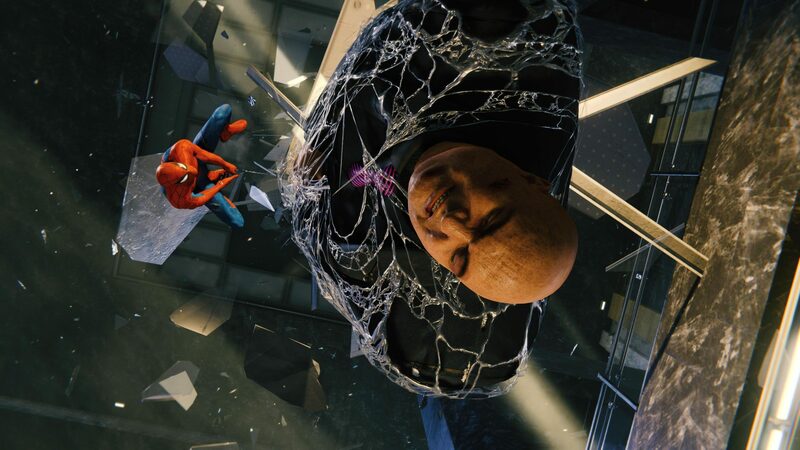 Just like with the story and the web swinging mechanics, Insomniac have done an excellent job at ensuring there is very little downtime in combat no matter the player’s skill level. Of course it wouldn’t be an Insomniac game without a plethora of extra skills and gadgets to unlock as well, and again these are great at adding extra depth and skill to the combat for players who want to seek it out. That said, it can be easy to accidentally fall into a rhythm of exploiting the fairly cheesy aerial attacks for about two-thirds of the game, at least until the bad guys start getting a hold of rocket launchers. Tying all of this story, traversal and combat together is a core gameplay loop that alternates between tightly scripted narrative sequences, action-packed linear missions and player-driven open world gameplay. Despite being quite transparent in structure and rarely deviating, it’s a nice, tight cycle that works well in both long and short play sessions and goes some way to stymying the overwhelming-ness of some open world games. The main story missions are consistently great, offering up a good mix of freeform action and exciting set pieces that demonstrate all the charm and polish of a PlayStation exclusive third person action game. Surprisingly enough, some of my favourite moments were the forced ‘stealth’ sequences, many involving taking control of plain-clothes Peter Parker as well as other key characters like Mary-Jane Watson. While stealth in these parts (and in the regular Spider-Man stuff) is fairly pedestrian, it’s forgiving and compelling enough that it makes for a nice palette cleanser between the punching and shooting. The game’s open world bits however, aren’t quite as successful. The array of collectibles to find, crimes to stop, bases to liberate and challenges to complete aren’t necessarily bad by any stretch, but they’re a just a little uninspired compared to the rest of the game and generally feel like padding more than anything. Granted, extracurricular activities are the main source of resources for buying new suits and upgrades, so they’re worth doing, if only because there are so many awesome unlockable suits. You’ll get every chance to ogle all of those suits too, because Marvel’s Spider-Man is one gorgeous looking game. Sony money and a history of industry-leading design means that Insomniac have been able to pour ridiculous amounts of detail into absolutely everything. Manhattan looks phenomenal no matter what the weather or time of day, with the midday sun gleaming off of tall buildings as they rush by or the bright lights of the city reflecting on the waterfront under the night sky. Spider-Man and friends/foes are wonderfully modelled, animated and acted and go a long way to lending the story the authenticity that makes it so engrossing. There’s a strong and consistent design aesthetic through the game that is decidedly Marvel-esque while retaining the kind of vibrancy and enthusiastic character of an Insomniac game. The dynamic, orchestrated soundtrack punctuates every kind of moment in the game perfectly too, adding further proof that this is every bit the cinematic superhero experience that Spider-Man’s feature films aspire to be. For all its successes, it’s important to note that Marvel’s Spider-Man would be nothing without the years of lessons learned from other games (and films). Insomniac have done a commendable job of pulling these various pieces into a well-rounded and highly polished whole, but the adverse side effect is that while incredibly fun, it’s not particularly memorable. It is, appropriately, the equivalent of a big Hollywood ‘summer blockbuster’ superhero film, it’s popcorn entertainment fuelled by a truckload of cash and a fanbase that revel in the excess of it all. By no means is this a bad thing, either. As far as mass market and broadly appealing video games go, this is one of the best. Marvel’s Spider-Man is a well-oiled machine made up of very smart and mechanically sound parts. It’s got a great story, fantastic core traversal and combat mechanics and a satisfying and compelling gameplay loop. Where it falters slightly in its open world, it more than makes up for by taking the best bits of the superhero games and films of recent years and mashing them together into one cohesive, exciting and most importantly fun product.